*Diagrams sourced from Gov.uk website. Check seat adjustment, locks in various positions. Commence on the N/S of the vehicle and check all testable items; N/S mirror if obligatory, open passenger door from inside, SRS. Move down column, indicators, light switch, wipers and washers, hazards (Ignition on and off). Pump out servo (Engine off), master cylinder checks sponginess and creep, gentle pressure then rapid pressing of pedal. Check all testable warning lights, TPMS, ABS etc. Engine still running, (Vehicle on hard standing, not on turn plates), check for PAS operation, open driver’s door from inside, step out but hold onto the steering wheel and check free play looking at the O/S road wheel. Move to front of vehicle – stand back, check reg plate (Including correct number), lighting – condition and security. N/S front, bumpers, sharp edges, security of number plate. Seat back upright, check security. Is seat belt attached to seat?, seat security, seat belt security, seat belt condition, seat belt receiver security, interaction of belt with receiver, floor structure around driver’s seat. Open rear door from outside (testable item in itself); door aperture, structure, seat belt attachment, seat security, seat belt condition, security of rear of driver’s seat. Move to O/S rear quarter; body structure, security, fuel filler and seal (if appropriate), security of lights. Body structure, (finger and thumb) lift carpets open panels etc. if no tools required. Check seat belt mountings for rear seats and condition if appropriate. Close boot – work down N/S exactly as per O/S back to front of vehicle. Engine not running. Under bonnet examination, body and structure, steering, suspension, brake pipes and hoses, fuel pipes battery security and wiring, fluid levels, engine mountings, exhaust. VIN if appropriate. Assistant in (Vehicle on hard standing) Start engine, check fuel and brake lines again with engine running and brakes applied. Assistant shakes steering wheel – observe steering system for play etc. Engine off – commence static inspection, move round in a box, from the driveshaft’s forward. Starting at O/S front of vehicle. Check everything again, (brakes not applied), brake pipes, brakes, hoses, fuel lines, front of front suspension, steering etc. Split remainder of car into 2 boxes down the middle of the car, starting at the front driveshaft’s backwards and work around each of the boxes. Check all items, working from front box down the vehicle, if hoist design permits, ‘pop out’ half way down and inspect outer sill. Then ‘pop back in’ and continue round the boxes checking all items. Vehicle still on hard standing;jack up rear. 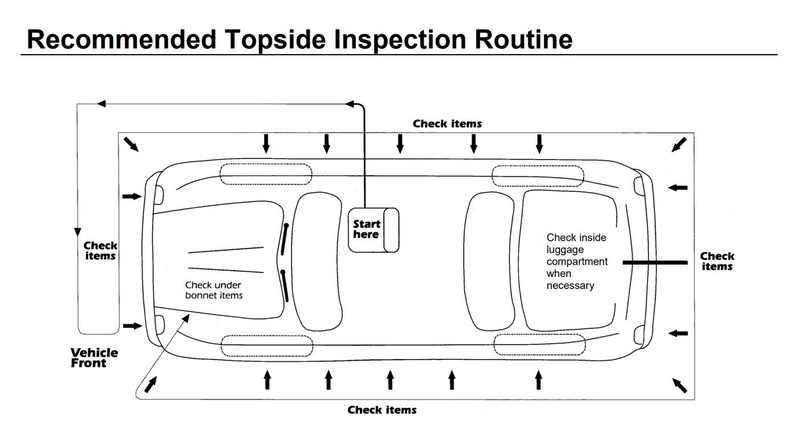 Examine rear of vehicle; suspension items now exposed, rotate wheels, check rims and sidewall (Inner). Check corners, check centre of wheel (hub cap), valves, rim, outer side wall and tyre tread depth. Rock wheels and rotate – check for roughness in bearing. Check rear corners, body and structure, fuel tank, fuel pipes, brake components and different view of all components. 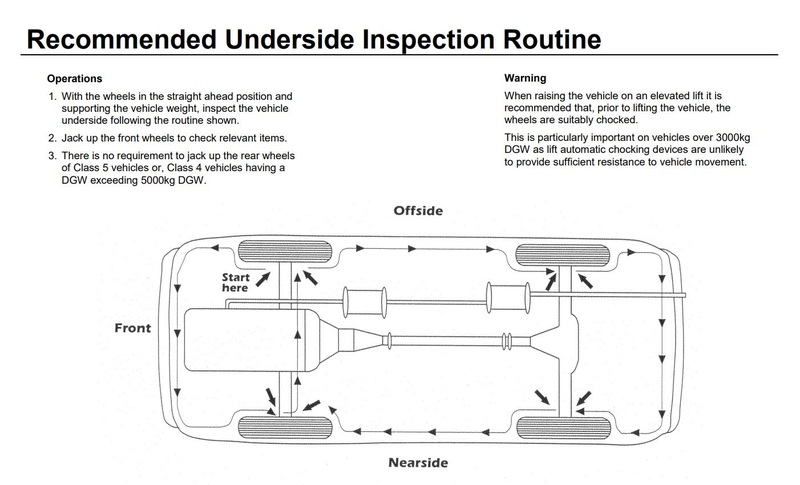 Move to front, jack up – determine where vehicle should be jacked dependent on suspension type. Put on lock, examine entire circumference of tyre, observe different view of components, move to other lock and repeat process. – If suspension is such that vehicle is jacked under suspension arm, there is no requirement for this check. Engine off, key out, check steering lock operation.